Samwise Gamgee of The Lord of the Rings loved potatoes, as fans of the series may know. But how do you think Sam stored them before he boiled them, mashed them, and so forth? 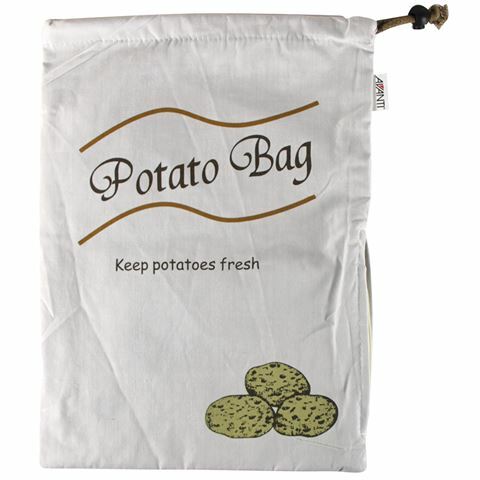 Maybe he had a Potato Bag like Avanti’s? Every Hobbit (and human, for that matter) ought to have one, because it’s the simplest way to store this vegetable staple. It’ll keep your potatoes dry so that they don’t sprout, prevent dirt from scattering across your pantry floor, and make them easier to find in your kitchen. If what you need are some good ‘taters, then Avanti has the means to store them when the hankering comes along. Black lining keeps potatoes stored in the dark. Keeps potatoes dry so that they won't sprout.